Lifting chains are used to hoist and manoeuvre items safely and efficiently. 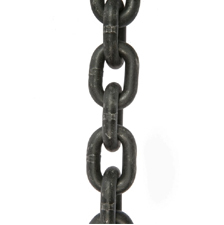 All our chains are made of high-grade steel that has been quenched and tempered for extra security. You can choose the exact lifting chain needed to meet your specific requirements. We offer single, two, three and four leg grade chains which come in lengths ranging from one to 10 metres, while each chain comes in 7mm to 16mm thickness range. 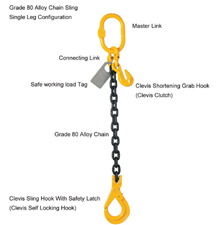 You can further customise your lifting chain by adding one of our extensive range of hooks and shortening clutches. Both our chains and chain components are constructed of grade 80 heat-treated alloy steel that is fully tested and certified. Grade 80 steel is specifically designed for overhead lifting applications. If you have any questions about lifting chains then please contact our expert team.